Temperament: Shy but sweet and affectionate. Willow and her siblings were fortunate to be born safely inside thanks to a kind lady who rescued their mother when the poor cat was discovered stray and struggling in the winter cold. Several weeks later, she received a surprise when her rescued kitty gave birth to a litter of 5 kittens! Although she was happy to keep the mama, the lady reached out to RCR for help in finding the kittens good homes. Willow is a sweet and petite kitten who is a bit shy at first, but a very loving little girl once she knows you. Like her siblings Clover and Waldo, she likes to play but is more cautious and you may see her on the sidelines observing before she jumps into the fray. If you are looking for a calm, affectionate cat companion who likes to snuggle, Willow may be the one for you! 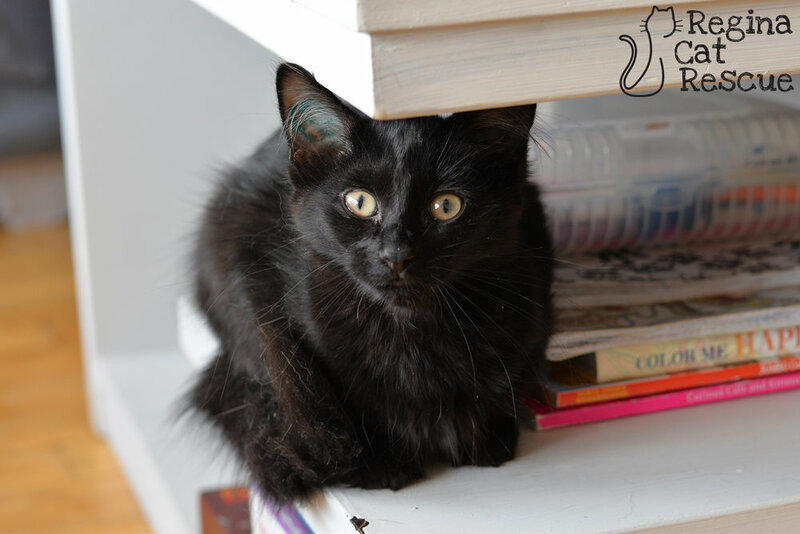 If you are interested in Willow, click here to view our adoption contract and click here to complete an adoption application or email the RCR Adoption Coordinator at adoptions@reginacatrescue.com for more info.